Traditional martial arts is not supposed to be glamorous, and conditioning is not a very glamorous process, being a very repetitive and monotonous type of exercise requiring many years of training. Traditional martial arts is not supposed to be glamorous, and conditioning is not a very glamorous process, being a very repetitive and monotonous type of exercise requiring many years of training. It is, however, a very inherent part to traditional training that is often overlooked by many practitioners today. The general public often confuses flashy jump kicks and clanging weapons with what martial arts is really about. There is a heavy component in martial morality and discipline that should be inseparable to the training. Recalling the definition of Kung-Fu (“energy” and “time”), we know that Kung-Fu never had the meaning of fighting or killing associated with it; essentially, Kung-Fu means “hard work,” something that takes a lot of energy and time to accomplish. 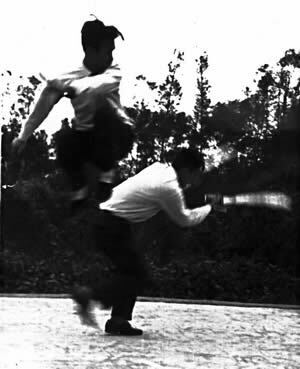 Most Chinese martial arts styles were developed as methods of self-defense, not to show off or best other people. The media has done much to promote and propagate martial arts in the world, but it sometimes portrays distorted perspectives of it. Most people are accustomed to seeing fancy flying kicks, twirling swords, or swinging staffs when they think of martial arts, especially when martial arts is depicted in the entertainment industry. What many do not realize is that there is a distinct difference between performance martial arts and practical, effective martial arts. One of those differences is that you do not need the same amount of conditioning in a performance that you would need for a fight. Before acting on an opponent, study your opponent's moves and mannerisms, and then judge whether the fight is worth pursuing. Every fighter comes to the table with their own background and experience. Sun Tzu's Art of War says to “know yourself and know your opponent” in order to win a battle. This means that you should get to know as much as you can about your opponent while revealing as little as you can about yourself to win. It is possible that you might have no chance of winning, in which case you should probably flee, instead of foolishly trying to face an adversary you cannot overcome. On the other hand, it is possible that your opponent stands no chance against you, in which case you must check your ethical code and ask yourself what reasons you have to overtake a weaker opponent. If both of you are equally matched, then there are many other factors that apply in order to win, such as bravery, endurance, concentration, natural reaction, and muscle memory. Having high spirit is also important because it contributes to good rooting, structured body movements, alertness, and awareness of surroundings. Additionally, the fighter with the higher spirit will have more confidence and be able to intimidate their opponent more. You may find sometimes that it is possible to stop a fight before it even starts simply by having a higher spirit than your opponent. A smart fighter will also have intelligent fighting strategies, being able to quickly adapt to the dynamic, changing situations of a fight. You should be able to subconsciously evaluate how a fight progresses and analyze the best options presented to you. For example, if you break your arm in the middle of a fight, it is probably in your best interests to stop the fight somehow, possibly by surrendering or fleeing. Another example would be if your opponent suddenly gains a weapon, either one that was concealed or one taken from the surrounding environment. Depending on the weapon, it may not be worth continuing the fight. There is no glory in dying from ignoring the dangers of a weapon, whether it be a gun, knife, or other. A fighting situation can also change if people you care about are threatened or taken hostage. Again, an intelligent fighter must be quick to think and react to such dilemmas and hopefully choose the best course of action. Because of the diverse combinations of strategies and skills that you and your opponent may have, it can be difficult to tell who will reign victorious in an encounter. There are many practitioners who often seek to become fighters for competitions, fighting in a ring. Fighting in a ring is significantly different than street fighting. In a ring, there are usually competition rules that help to protect fighters from getting seriously injured. It's a bit paradoxical. Fighting is meant to hurt your opponent, but in a competition, you are not really allowed to do that. My recommendation to fighters who train to compete is to remember that competitions are simply a training tool or training method. They help you get accustomed to being in a type of fighting situation, but they do not substitute for an actual fight. Be aware of the rules that protect you in a ring that won't protect you in a fight outside of the ring. For example, be aware of whether your groin and eyes are exposed and be sure that you at least have the reaction to block an attack to such areas, even if competition rules forbid such strikes. Just because you can win a fight in the ring, it does not mean you can win a fight outside of it. Don't ever forget that fighting in a ring is not fighting on the street. I encourage you to never forget the background and history behind training martial arts. Never initiate a fight using your skills; only act for defensive purposes when you are absolutely forced to do so. A part of intelligent fighting and strategy is knowing consequences. Just because you win a fight this week, it does not mean you will win again next week when your opponent shows up with 5 of his friends, all eager to hurt you, your friends, and your family. Even if you win the fight again that week, the situation might press on for weeks more, or possibly months, years, and generations. More and more people may also become involved. There is no point in starting such a war. Sometimes ask yourself what the intentions are behind your training. Are you looking to simply fight, to know self-defense, to gain fame and glory, to compete, to hurt others, or to train your own self-discipline and way of life? Today's society will lock up and sometimes execute those that hurt others. It is not always in our best interests to become involved in violent situations. We cannot single-handedly oppose the world and the society we live in, especially if we are to be a part of this world and this society. The best fight is “no fight.” If possible, always search for the “no fight” resolution. Read Part 1 of Martial Arts Conditioning and Fighting.